Known as one of the most iconic venues in North American eventing, Plantation Field in Unionville, Pennsylvania can be likened to Keeneland or Saratoga for equestrians. Each year the facility hosts the Plantation Field International Horse Trials, one of the premier eventing competitions in North America that routinely draws Olympic and World Equestrian Games-caliber competitors. This year on September 23 the event is back, boasting a new roster of riders, many of whom will be riding in a jumping competition for the first time in their lives! Spearheading preparations for the event are Graham and Anita Motion, who said the idea came about because they wanted to do more to showcase how successful Thoroughbreds are in the world of eventing. Just as they were last year, this year's teams are grouped together based on their involvement in the horseracing industry: exercise riders, owners, racing analysts and trainers. All of the competitors will be wearing silks during the competition and while some will be aboard their own horses, others will be riding donated horses who are borrowed for the day to match their rider's abilities. Last year two-time Olympic gold medalist Phillip Dutton, who has taken a number of horses from the Motion's Herringswell Stable (including Icabad Crane) and transitioned them into the discipline of eventing, walked the show jumping course with the riders prior to the event and offered hits and tips on how best to navigate it. Each rider was tasked with raising pledges, with proceeds of the event benefitting Plantation Field and the Retired Racehorse Project, both 501(c)(3) charities. 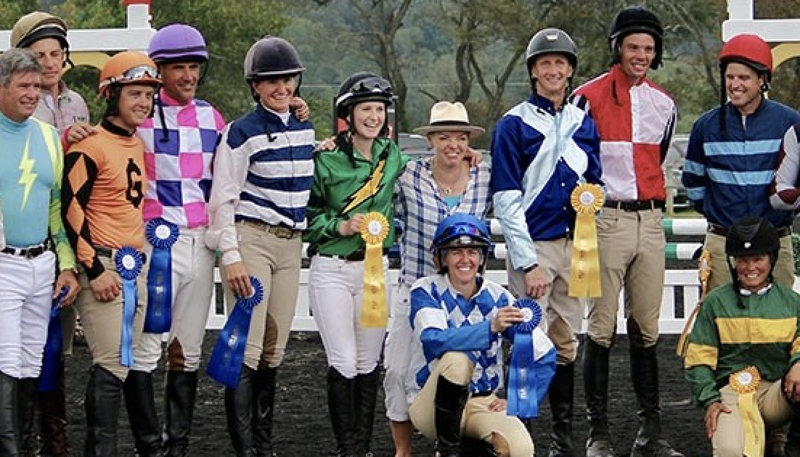 While last year's winners were the “trainers” team, consisting of Leigh Delacour, Sanna Neilson, Joe Sharp, Chuck Lawrence and Tim Keefe, this year it's a new roster of riders competing for the top prize. To make a pledge to support any of this year's riders, visit https://www.plantationfieldinternational.com/index.php/real-rider-cup-2018. This entry was posted in Aftercare Spotlight, Horse Care, NL List and tagged anita motion, Cosequin Presents Aftercare Spotlight, Graham Motion, Jen Roytz.Aftercare Spotlight, Phillip Dutton, Plantation Field, Real Riders, Thoroughbred aftercare, thoroughbred retirement by Jen Roytz. Bookmark the permalink.